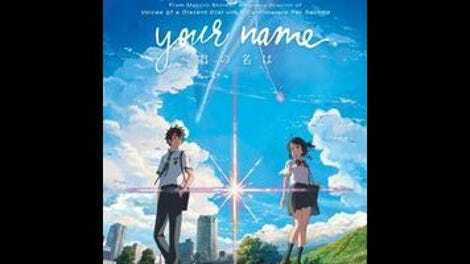 Already the fourth-highest-grossing film ever in its home country of Japan (trailing Spirited Away, Titanic, and Frozen), the anime romance Your Name boasts a fate-driven appeal that’ll be quite familiar to Americans who love Nicholas Sparks novels and their onscreen adaptations. Initially, the story appears to be a basic Freaky Friday-style body swap, albeit with a slight twist: The people involved don’t know each other at all. One day, Tokyo teenager Taki (voice of Ryûnosuke Kamiki) mysteriously awakens to find his consciousness inhabiting a girl of roughly the same age, Mitsuha (Mone Kamishiraishi), who lives in a rural area some 200 miles away. He spends a confused day struggling to maintain this stranger’s routine, unaware that Mitsuha is making the same effort in his own body. The next day, everything’s back to normal, but the switch keeps happening, seemingly at random. Eventually, they start communicating with each other, leaving messages in Mitsuha’s notebook and on Taki’s smartphone. That synopsis constitutes roughly the first half of Your Name, which takes an unexpected turn shortly thereafter. 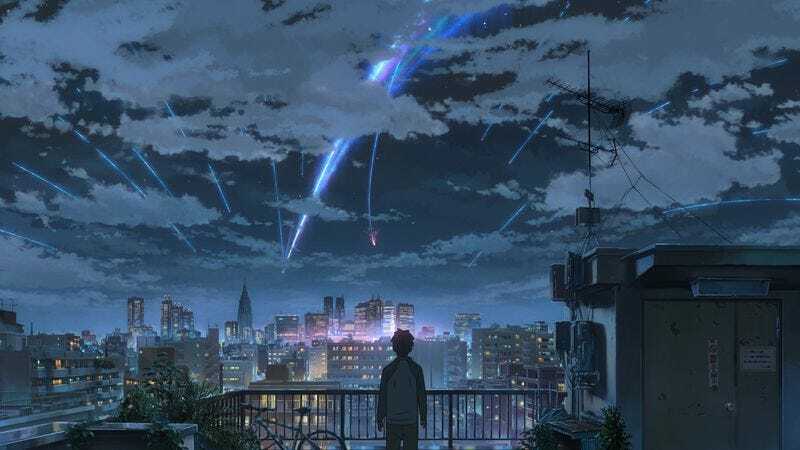 The surprise lies not merely in what happens next, but in the way that this new direction abandons ideas that writer-director Makoto Shinkai had seemed to be carefully developing in favor of something else entirely. The film’s body-swapping setup foregrounds questions of identity, beginning with the way that both teens react to their new, temporary genders; Taki-as-Mitsuha spends so much time feeling up his own breasts, for example, that it becomes a running gag. Meanwhile, Mitsuha-as-Taki starts flirting heavily with a slightly older female co-worker (Masami Nagasawa) at the restaurant where Taki works, and it really looks as if Mitsuha herself is smitten, rather than merely doing Taki a favor while she’s in control of his actions. The stage is clearly set for these characters to apply what they’ve learned as each other to their own lives, in the grand tradition of this very specific subgenre. That’s not Shinkai’s plan, however. Instead, Your Name abruptly shifts gears into a more Sparks-like vein, creating an urgent scenario in which one of the characters has to traverse both time and space to save the other’s life, as well as create a circumstance in which the two can finally meet in their own bodies. This doesn’t make a whole lot of emotional sense, as Taki and Mitsuha don’t know each other, except through their notes (which, from what we see, are strictly practical: do this, don’t do that); no real foundation exists for the date with destiny that takes over the movie’s second half. There’s admittedly a certain pleasure in the deft fake-out that Shinkai executes here—most viewers will automatically make an assumption that’s ultimately proven wrong—but it comes at the cost of overall narrative incoherence. Thankfully, Your Name is consistently gorgeous to look at, marrying traditional anime character design to stunning, not-quite-photorealistic backdrops (an integration that works much more smoothly here than it did in Pixar’s The Good Dinosaur, perhaps simply because cartoon humans clash less with a credible environment than do talking animals). Shinkai and his team play with depth of field more than one usually sees in traditional animation, sometimes including both foreground and background objects that are out of focus; the film was reportedly created via initial hand-drawn images that were subsequently scanned and digitally augmented, and the resulting look, while certainly familiar to anime fans, is also pleasingly distinct. If Shinkai can eventually pull off the same neat trick as a screenwriter, cinephiles will surely remember his name. Note: Although we reviewed the subtitled version, Funimation Films is releasing a dubbed version in some theaters. Remarkably, the English-language voice cast does not feature any big Hollywood stars.